Bishop David Oyedepo re-echoes the words of Mazi Nnamdi Kanu and in strong terms rejected the moves by the Islamic political leaders who dominate the the Nigerian government, for their roles in dragging Nigeria deeper into the Islamisation agenda. The founder and general overseer of the Living Faith Church, also known as Winners Chapel, Bishop David Oyedepo takes the bold step to use the same words of Mazi Nnamdi Kanu in describing the religious influence over the ongoing political turmoil in Nigeria. The Bishop pointed out in clear terms that the "Inclusion of Arabic Studies in Police Recruitment Test is a move to Islamise Nigeria. He comes to terms with Mazi Nnamdi Kanu who began to create the awareness of the renewed Islamisation agenda in Nigeria. While addressing the congregation who are now becoming conscious of the implication of the Islamisation agenda on Christians in Nigeria, members who are predominantly Biafrans remember the words of Mazi Nnamdi Kanu in radio Biafra London listened with curiosity and the Bishop who must be concerned about the feeling of his members in the ongoing fight for faith in Nigeria pointed out that Muslem Politicians are biting more than they can chew. Bishop David Oyedepo cried out that President Muhammadu Buhari is deliberately promoting policies that cause religious war in Nigeria. It is clear that the Nigerian president who is a product of the APC Islamic terrorist party is now dancing in the open. The hidden Islamisation agenda that was uncovered by the leader of the Indigenous People of Biafra is now being displayed in the open. Buhari has proven to be in support of the Islamisation agenda by promoting policies to enhance and impress Islam in everything and everybody in Nigeria. The most recent that has been causing uproar is the inclusion of of Arabic studies in the recent Nigeria Police Force NPC recruitment Test. "The inclusion of of Arabic studies in the recent Nigeria Police Force NPC recruitment Test is highly unacceptable." 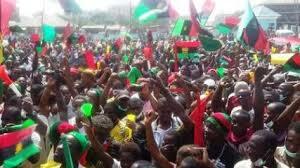 However, to declare the Islamisation agenda "Unacceptable", The Bishop could be banking on the efforts of the Indigenous People of Biafra as the only freedom fighting organisation with tenacity, who have succeeded in attracting the international community to the horrible killing of Christians in Nigeria. The Bishop insists that the Arabic that the further call for the NPF recruitment test should be rewritten and the Arabic studies be scraped. In what he knew the President Muhammadu Buhari would never do, he passed a final verdict, he said, "We therefore reject the NPF recruitment Test and ask for it to be re-written without the inclusion of the Arabic Studies."